Euploidy is a condition where one or more full sets of chromosomes are in an organism. The euploids may be Monoploids, Diploids (normal organisms) Polyploids. 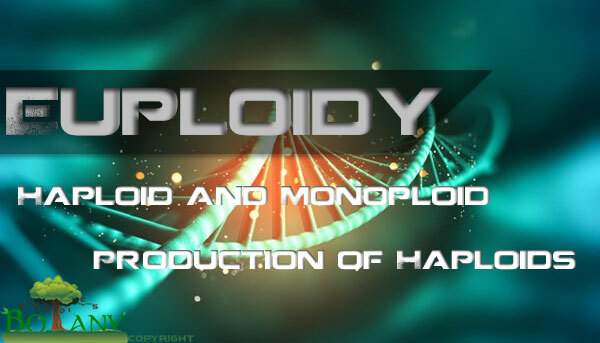 A distinction should be made between monoploidy and haploidy. Monoploids can be distinguished from haploids as they have a single basic set of chromosomes, e.g., in Barley (Avena sativa) 2n = x = 7 or in Corn 2n = x = 10 where x = basic number, while the Haploids have half the somatic number of chromosomes found in normal individual. i.e., each chromosome is represented once. Therefore, individuals having 2n = 3x = 21 in Wheat would also be haploids because these haploids are obtained from polyploids, therefore, these are often called Polyhaploids. In some cases, e.g., in male insects the haploids are produced due to parthenogenesis. In these insects, the queen and worker bees are diploid females. The haploids also originate due to development of egg parthenogenetically in flowering plants, e.g., in tomatoes and cotton. The haploids also originate from pollen tube, synergids or antipodals of the embryo sac rather than from egg. Such haploids are known as Androgenic Haploids. Most important of these are distant hybridization and Anther culture. Since in a haploid set, the chromosomes are non-homologous and have no homologues to pair with, they are found as univalent at metaphase I of meiosis. Consequently, these univalent distribute at random during anaphase I. For example, a haploid in Maize (2n = 20) will have 10 chromosomes and the number of chromosomes in a gamete of a haploid plant can range from 0-10, resulting in sterility. The haploids are characterized by a reduction in size of all vegetative and floral parts than a diploid. The haploids are used in production of homozygous diploid as haploids can be doubled by colchicine treatment. These homozygouss diploids are used for cultivation, e.g., in Barley, Rice Tobacco and Wheat.